Colombo, 14th June 2018: Sri Lanka’s premier cement manufacturer, INSEE Cement together with its sustainable waste management arm INSEE Ecocycle, joined hands with Biodiversity Sri Lanka (BSL) – a network of private sector companies working together on conservation issues and the Base for Enthusiasts for Environmental Science and Zoology (BEEZ) of the University of Colombo, to commemorate World Environment Day celebrated on the 5th of June every year. Taking forward the United Nation’s theme for the year – ‘Beat Plastic Pollution’ provided an opportunity for the Government, Private Sector and Academia to showcase their best practices to mark the important day meaningfully, at a time when across the globe, plastic pollution has risen to unprecedented heights. INSEE has heavily invested in reducing CO2 emission in the manufacturing process while investing in recycling water, recycling paper, harvesting rainwater, using less water and energy in its manufacturing and kiln processes and promoting natural light and ventilation, while it has also placed more focus on innovation to create environment-friendly raw materials. At the interactive panel discussion moderated by Ms. Shiranee Yasaratne – Advisor, Biodiversity Sri Lanka, commended INSEE Ecocycle’s endeavours to promote and protect biodiversity. Quoting statistics from the United Nations, she said “500 Million PET bottles are being disposed of on a daily basis around the world, and as much as we need to stop the generation of such waste, it is also important to have in place, mechanisms which will take care of the waste responsibly prolonging its useful life and ensuring that it does not end up in a landfill, creating immense problems to biodiversity and the receiving environment”. Prof. Sarath Kotagama, Department of Zoology, University of Colombo was among the speakers and his topic was ‘When will we not produce waste?’. “Avoid waste is the honourable thing that we as human species can do to this planet. But we have lost our role. When I say you can live without plastic people laugh at me because most of the people who are living today have not lived without plastics. In my age, I have lived 50% of my life without plastics so there is a problem. Unless you have experience of living without plastics you will not know how to live without plastics,” he said, adding that the challenge was not to ask what to do with waste but not to produce waste. Sanjeewa Chulakumara – General Manager of INSEE Ecocycle commenting at the forum said, “We collect waste from around 500 companies and we are the only company in Sri Lanka to dispose hazardous waste in an environment friendly manner through cement Kiln Co-processing. Ecocycle believes in Polluters Pay concept as well as extended producer responsibility. We are thankful to our stakeholders, especially the regulators for supporting us to implement this concept among the industrial waste management sector. However, this concept is yet to achieve the important milestone of reaching out to the communities in Sri Lanka. Proper waste management will soon become an essential utility service in Sri Lanka”. Chulakumara explaining best practices in sustainable waste management solutions in Sri Lanka said that the waste management hierarchy should be the mantra of everyone and ‘avoid’ was the most important factor. Prof. Lakshman Dissanayake – Vice Chancellor of the University of Colombo was appreciative of the contribution that INSEE Cement and BSL are making to safeguard the environment. He detailed the measures that the University of Colombo was taking, He mentioned about making the University of Colombo polythene free as an endeavor by the Center for Environmental Initiatives of the University, and appreciated the support given by students in implementing it. He also thanked the Central Environmental Authority for funding for a temporary storage unit for recycleable waste on campus. He asserted that events of this nature brought to light steps that are being taken by all sectors in grappling with a national issue. He was appreciative of the large student audience present at the occasion. The tagline for this year’s UN declared theme is ‘If you can’t reuse it, refuse it’. 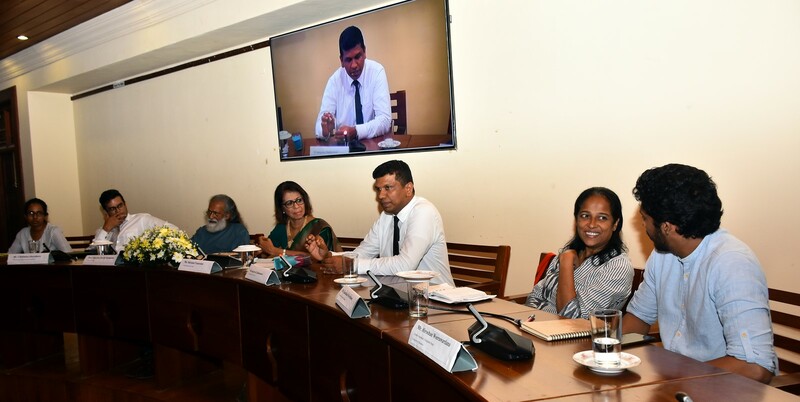 The accumulation of plastic waste in homes and industries has increased rapidly and the municipal system in the country does not have the capacity and the infrastructure to handle the plastic waste generated across Sri Lanka. Several successful biodiversity conservation initiatives have resulted from INSEE Cement’s endeavours. All projects identified are compiled within the framework of global co-operation between IUCN and the INSEE Group of Companies and has helped to develop strategies with a focus on supporting sustainable livelihoods and biodiversity conservation. More importantly, the initiatives encourages good practices in sustainable construction within the industry and the community for a greener Sri Lanka.